Drive Medical Cirrus Plus Folding Power Wheelchair Review – Is It Perfect for You? 3-Wheels Electric Scooter Review – Is Golden Technologies GL110 Golden LiteRider for You? Accessbuy Electric Portable Wheelchair – Is It Among the Best Wheelchairs for Disabled People? Motorized Chair Stair Climber Review – Is It Practical and Reliable? Heavy Duty Wheelchair Review – Is Heavy Duty KD Smart Chair the Best for Big People? The product is a recent market entrant and this made me pay closer attention to the Standard KD Smart Chair electric wheelchair. I was happy to discover that it is approved by the FDA. This gave me complete confidence about using it. What I like the most about this model is that it folds compact for storage. This is a simple, quick and easy task. When folded, the wheelchair measures 33 by 25.75 by 16.75. It can be easily fitted into the trunk of most cars. I think that the footrest could benefit from some texture, so that it is completely slip-resistant even when the user is wearing slippery shoes and/or the humidity is high. Apart from this, I like everything about the Standard model and I’d like to highlight this in my KD Smart Chair review. Having a reliable personal mobility device means getting independence which is highly beneficial for you and for your family. I am a huge fan of technology and always looking for something new and more advanced in the field of electric wheelchairs. This is how I discovered KD Smart Chair. The brand offers two power wheelchairs and a range of practical accessories to go with them. I can confidently say that I know enough about them to give you a personal and thorough KD Smart Chair review. Take full advantage of it. In my KD Smart Chair review, I will cover the two types of wheelchairs which the brand offers: Standard and Heavy Duty. I will evaluate all accessories which go with them too. They are diverse, but not many, so you should not expect a way too lengthy review. I’ll pay special attention to the pre-owned Standard and Heavy Duty power wheelchairs which the company sells by devoting an entire section to them. The company is a recent market entrant and this made me pay closer attention to the Standard KD Smart Chair electric wheelchair. I was happy to discover that it is approved by the FDA. This gave me complete confidence in using it. Here I’ll share my findings. This is one of the lightest power wheelchairs and this is something which I feel obliged to highlight in my KD Smart Chair review. The Standard model weighs just 50 pounds while being capable of supporting user weight of up to 265 pounds. This is thanks to the aluminum alloy construction which is exceptionally lightweight and extremely strong and completely resistant to rust at the same time. The Standard KD Smart Chair electric wheelchair is 33.1 inches long, 23.2 inches wide and 38.2 inches high. This makes it one of the most compact models in the market. You will be happy to learn that it folds flat effortlessly in just a few seconds. When folded, it measures 29.5 by 23.2 by 13 inches and this enables it to fit snugly in a car trunk. One of the huge advantages of this model which I’d like to highlight in my KD Smart Chair review is that it can be taken on board a plane and a water vessel. The seat, which measures 16.75 by 15.25 inches, has nice padding and breathable fabric upholstery. I’m impressed with its ergonomic design which isn’t very commonly found. Both the cushion and its cover are removable and washable. The backrest offers excellent lumbar support and can be reclined if needed. There is a strong adjustable belt for maximum safety which is an extremely important feature. I love the fact that the armrests have thick padding. They provide perfect support and this is something every KD Smart Chair review should mention, I believe. 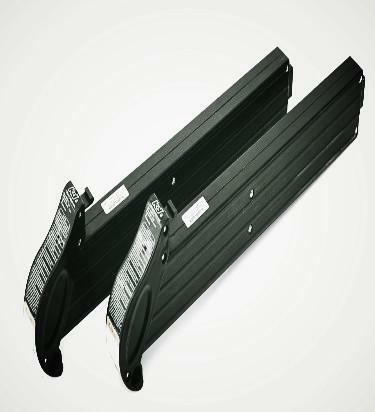 They are adjustable and can be raised when mounting and dismounting the wheelchair for maximum convenience. The footrest is wide and long enough for my taste and I’m quite picky. There is a band for supporting the calves which is a truly valuable feature. Overall, I’m more than happy with the level of comfort and safety which this electric wheelchair offers. The large padded handle of the Standard KD Smart Chair wheelchair is a great feature that caregivers find particularly useful. There is no risk of losing grip of the wheelchair when the person’s palms are sweaty. Another practical feature is the mesh basket under the seat. It’s large enough to hold all items which you may need when you are outside or at home. The rear wheels are large and wide, while the front ones are smaller but equally sturdy and reliable. 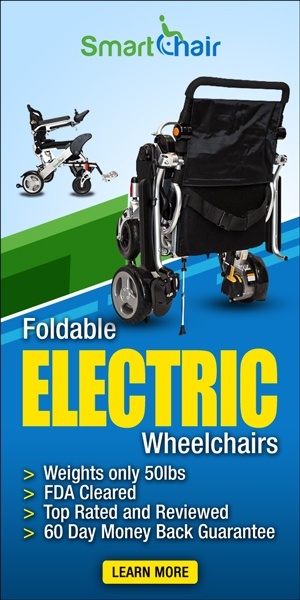 With these notable features and a turning radius of 31.5 inches, this electric wheelchair is highly maneuverable. It’s easy to take turns. Additionally, you can expect it to run smoothly even on slightly hilly and/or somewhat rougher terrains. The motor performs reliably at all times. In my opinion, the Standard model is a great performer and I’d like to emphasize on this in my KD Smart Chair review. 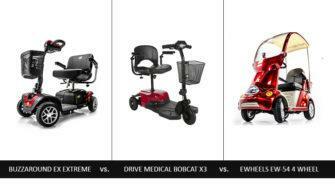 Besides, it has a top speed of 5 mph which is great for a personal mobility device. When it comes to steering, you should know that the joystick can be mounted on your preferred side. Just remember to mention this when you place an order. The joystick is very responsive, but not to the point at which it will react to a light touch. This is something worth noting in every KD Smart Chair review. 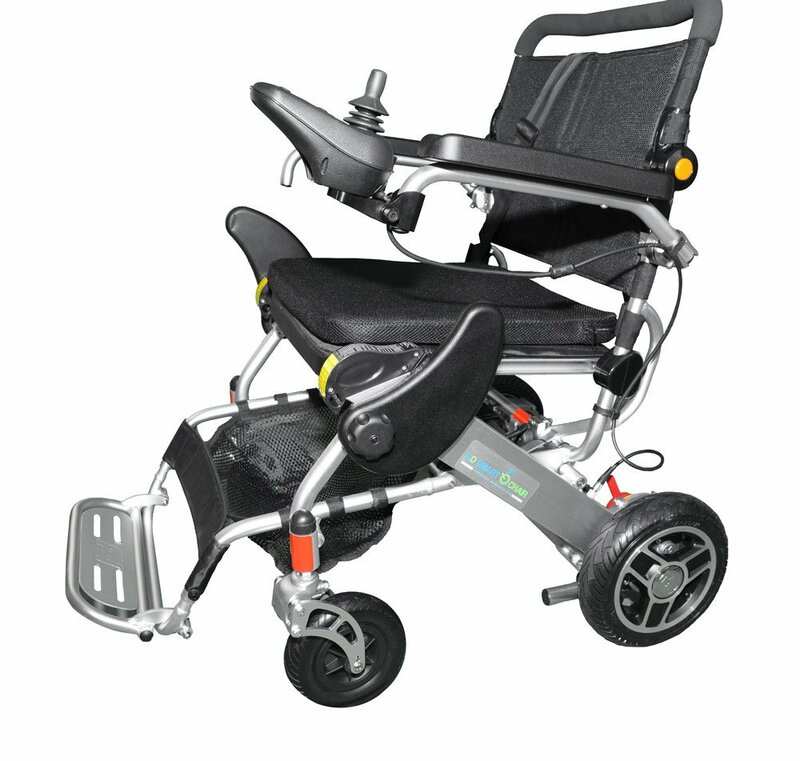 Equipped with a 10AH lithium ion polymer battery, the Standard KD Smart Chair electric wheelchair can cover a distance of up to 15 miles with a fully charged battery. This is an amazing performance, especially in comparison with the key competitors of the model. Another major benefit which I should point out in my KD Smart Chair review is that the battery is very quick to charge. It normally takes between 2 to 4 hours for it to be ready for use again. I think that the footrest could benefit from some texture so that it is completely slip-resistant even when the user is wearing slippery shoes and/or the humidity is high. Apart from this, I like everything about the Standard model and I’d like to highlight this in my KD Smart Chair review. The Standard power wheelchair comes with a 5-year warranty covering the frame and a 1-year warranty on the motor and electronic components. This is what you can expect from every high-quality unit. Additionally, the product is covered by a 60-day money back guarantee whose terms and conditions are readily available. Should you buy the Standard KD Smart Chair electric wheelchair? I think that it is a great choice for those who go out often and travel a lot. It’s suitable for home use too because of its compact size. It has a minor flaw, which is totally outweighed by the multiple benefits which it has to offer. The verdict of this KD Smart Chair review is that the standard model is superb. There are some similarities that the Heavy Duty model shares with the Standard one, but the differences are many. That is why I’m reviewing them separately. Find out what the model for bigger people like me has to offer and how good it is. With a capacity of 330 pounds, the Heavy Duty KD Smart Chair power wheelchair is perfectly suited for users who are bigger than the average. It measures 36 by 25.75 by 34 inches. Thanks to its fairly compact size, it can move easily even in narrow areas of the house or any other building. This personal mobility device is exceptionally light with its 59 pounds of weight, especially given its capacity and I want to emphasize on this in my KD Smart Chair review. This is because the frame is made of aluminum alloy, which gives the wheelchair great strength and durability. You should not worry about accidental hits or rust and corrosion. What I like the most about this model is that it folds compactly for storage. This is a simple, quick and easy task. When folded, the wheelchair measures 33 by 25.75 by 16.75. It can be easily fitted into the trunk of most cars. Generally, you can take the personal mobility device with you no matter what form of transportation you use. This is a key advantage which should be pointed out in every KD Smart Chair review. The seat of the Heavy Duty model measures 17 by 17 inches. This is more than many of the so-called luxury models which are intended to provide maximum comfort have to offer. As a big guy, I can tell you that the seat is spacious enough to make you feel great. It has an upholstered cushion which gives you extra comfort. With regular washing, the cushion and its cover will remain in excellent condition for a long time to come, I’m sure. The backrest has an ergonomic design to provide the required support and comfort. I appreciate the fact that it can be reclined. The seatbelt can also come in handy. I like the design and padding of the footrests and the fact that it’s easy to flip them when you get seated. The footrest and leg support band do their job well too. In my KD Smart Chair review, I’d like to share that I’m perfectly happy with their size. The mesh storage basket is large and convenient to use. It doesn’t get in the way when you are on the move or when mounting and dismounting the Heavy Duty wheelchair and this is a major advantage worth pointing out in this KD Smart Chair review. The large handle is superbly designed to give the caregiver a firm grip and to make pushing a breeze. 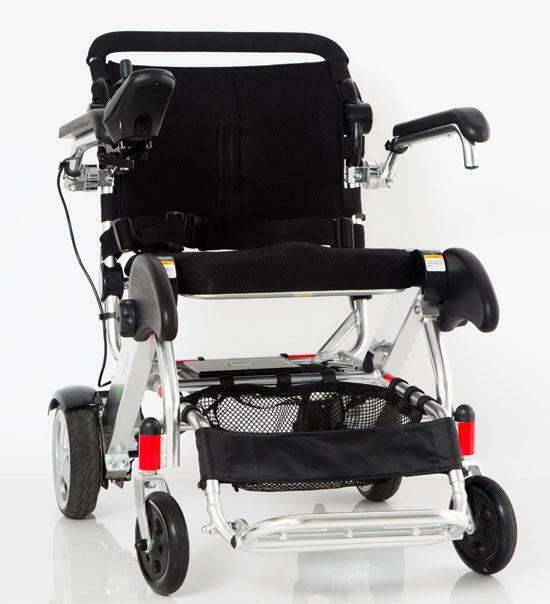 The motor of the Heavy Duty KD Smart Chair power wheelchair runs smoothly and the transmission works reliably. You don’t have to put an effort in steering as the joystick has the optimal level of responsiveness. You can have it mounted on the side which you wish. You’ll be happy to discover that this personal mobility device is equipped with large and sturdy wheels. The rear wheels measure 10 by 2.25 inches, while the front ones, 8 by 2 inches. They roll smoothly even on asphalt and grassy terrains. This is good news for people who love outings in the park like I do. Another key thing worth noting in this KD Smart Chair review is that the wheelchair can climb a slope with a 15-degree inclination. This may not seem like much, but you can expect superb performance even when the terrain isn’t even. The electromagnetic brakes work flawlessly too. The maximum speed of 5 miles is impressive and this is something which I want to highlight in my KD Smart Chair review. The Heavy Duty wheelchair of the brand is equipped with a 16AH lithium ion polymer battery which is quite compact and light. When fully charged, the battery gives the personal mobility device enough power to run for 15 miles. This is what I call a top performer. The charger is quite dependable too. The battery should be fully charged in four hours or so. Again, I wish the footrest had a slightly better design. In this section of my KD Smart Chair review, I want to share that I’m perfectly happy with all other features and capabilities. There is a 5-year warranty on the frame and a 1-year warranty on the electric and electronic parts. This is more than reasonable and beneficial. Additionally, the Heavy Duty wheelchair comes with a 60-day money back guarantee to make buyers completely comfortable with their purchase. 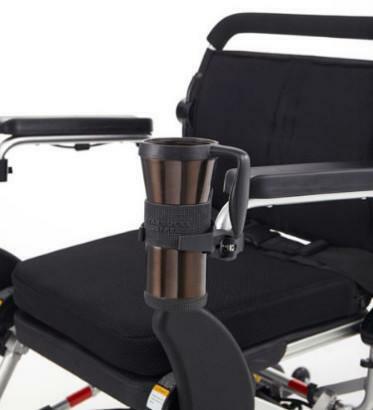 Should you get the Heavy Duty wheelchair after reading this KD Smart Chair review? It is an awesome performer while offering a high level of comfort and convenience. I think that it is great for bigger folks. Even the best electric wheelchair can benefit from some accessories which are not part of the main package. Use my KD Smart Chair review to decide which ones to add to your device. It’s easy to mount the cup holder to the front of the armrest where it will be super easy to access. I love how versatile the accessory’s design is. It can hold standard tea and coffee cups, mugs, bottles and cans. You’ll always have your preferred drink at hand. The cup holder has strong plastic make and supports the container from the bottom and the sides. In my KD Smart Chair review, I’d like to admit that this accessory is totally worth getting. 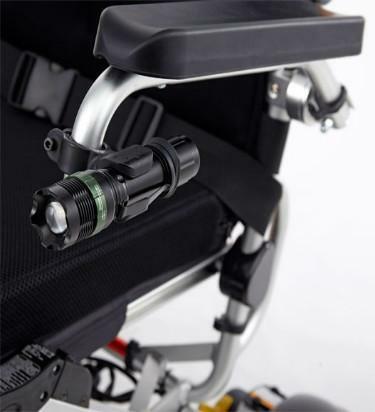 The kit includes a flashlight and a clip holder for mounting it easily to the front section of one of the armrests. Generally, you can attach the flashlight to any other part of the wheelchair, but I personally find this spot to be the best. The holder is sturdy, durable and easy to use. I’d like to point out in my KD Smart Chair review that the flashlight produces strong light and works reliably. It appears to be durable too. The plastic case is designed to virtually hug your smartphone and hold it firmly, securely and safely. It is suitable for both iPhones and Android phones. 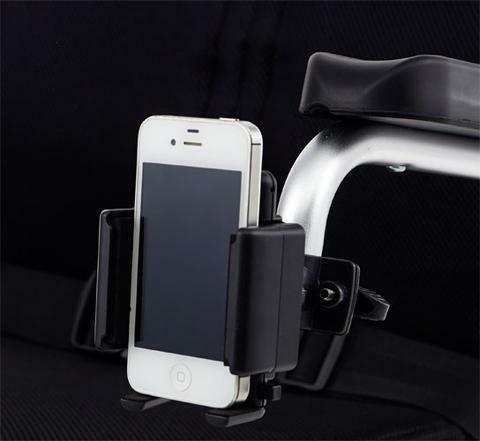 You can attach it securely anywhere on any of the armrests, depending on your preferences. The task is quick and hassle-free. In my KD Smart Chair review, I’d like to share that I personally prefer to keep an eye on the screen at all times. As said earlier, the Standard KD Smart Chair wheelchair is equipped with a 10AH lithium ion polymer battery, while the Heavy Duty one has a 16AH one. You can buy a set of two spare batteries of either type. Is this a good idea? It pays off to have spare batteries, given that even the best ones have a fixed useful life. If you have a limited amount of money to spend on a personal mobility device, you should consider this opportunity. Most of the so-called Open Box pre-owned KD Smart Chair wheelchairs have been returned to the manufacturer. There are also used, warehouse-damaged and refurbished models. Upon receiving them, the company runs a full check to ensure that they are in proper working condition. They have checked again before being shipped to the customer who has placed an order. I personally find this double check to be quite reliable. 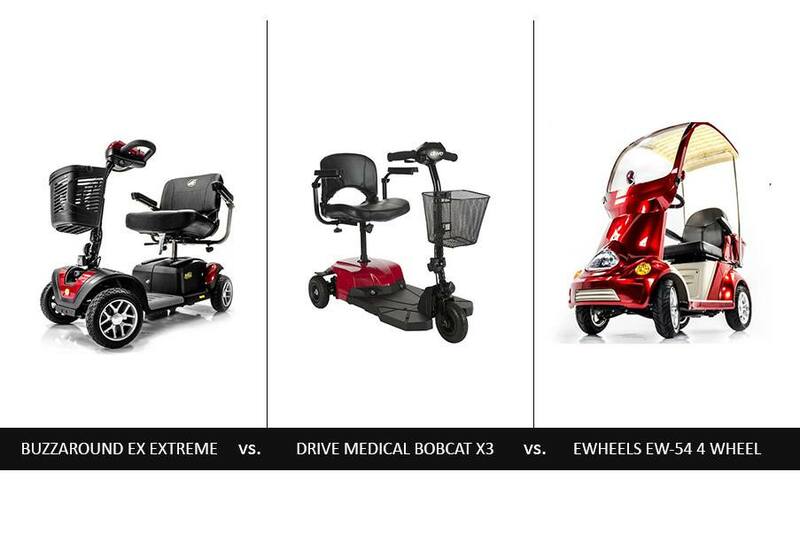 What can you expect from a pre-owned power wheelchair of the brand? It will have the exact same features and accessories as a new model. It will be completely clean and work as it is supposed to. I want to share in my KD Smart Chair review that even the pre-owned wheelchairs come with a warranty: a 2-year one on the frame and a 30-day one on the parts. I’d like to conclude my KD Smart Chair review by saying that you can purchase a Standard or Heavy Duty electric wheelchair from this brand with confidence that it will give you comfortable, safe and smooth rides. You can add one or more accessories for maximum convenience. With proper maintenance, the personal mobility device can last for a long time. Get more details and read more reviews below. Previous Tzora Titan Scooter Review - Is this Modern Mobility Device Right for You? Hello and welcome to my website! My name is Norman and here I’m reviewing power wheelchairs and scooters. I created this website because I wanted to help people who have difficulties with mobility find the right model that would give them greater independence. I’ve given lots of advice personally and I’m sure that now it can reach everyone who needs it. I used to be a professional weightlifter so I think that a person can achieve anything no matter what limitations there are and what obstacles can come up on the way. You just need to have the right mindset and tools. Check out my power wheelchair reviews to find the right tool for achieving your goals. EZ Lite Cruiser Review – Can this Power Wheelchair Match Your Lifestyle? Tzora Titan Scooter Review – Is this Modern Mobility Device Right for You? Royals 4 Mobility Scooter Review – Is It a Top Pick? Go-Go Ultra X Review – Is This the Ideal Mobility Scooter for You? E-Wheels EW-36 Review – Is This the Coolest Mobility Scooter for Seniors Right Now?